in his name publication. and on the living plant, so labeled. Branches flexuous. Branches rather thick and stiff. Leaves shaped as Hoya bordenii. Not a single leaf shaped as Hoya bordenii. 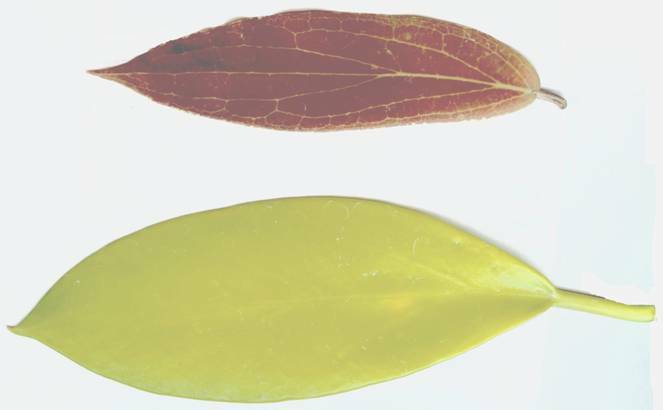 Top leaf: This is a typical Hoya bordenii leaf. Note that the leaf base is cordate; the petiole is short and sulcate. The apex is attenuate. Bottom leaf: This is a typical Hoya gigantangensis leaf, if what I have is Hoya gigantangensis. Note that the leaf base is acute and the petiole is not sulcate and it is very long. The leaf apex is almost shortly acuminate and curves down and to the side, almost like a hook. In Latin part, “Petiole lightly sulcate above” Those on my plant are not at all sulcate. Surely he had the specimen in front of him? Didn’t he? Petiole heavy curved. Those on my plant, not at all curved. on it. How did he know its length – or did he? He described the corolla (in the Latin part) as “glabrous up to the common people.” I kid you not! What is more interesting is that the “flower, side view” does not match the side view of any flower picture I’ve found, anywhere, labeled Hoya gigantangensis. Even more interesting is the fact that when I traced some of Mr. Kloppenburg’s pictures of Hoya burtoniae on tissue and placed them over the illustrations found on page II of the 4th quarter Fraterna 1992, where Mr. Kloppenburg published this name, I found a perfect match. And, NO, I’m not saying that Hoya gigantangensis is a synonym for Hoya burtoniae. I’m just saying that it appears that Kloppenburg described parts of at least two different species and illustrated his publication with at least one picture from a different species. It is doubtful that his holotype specimen contains more than one species so it must be the only place one can learn exactly what the features of the species with this name are really like. It may be that the reason my stalks, and leaves don’t match Kloppenburg’s description is because I’ve been sold a mislabeled plant but that doesn’t explain the discrepancies in his publication. All I can conclude from this and other publications of this author’s is that any editor who’d publish anything he wants published knows absolutely nothing about hoyas or has something to gain from publishing his drivel….. Or the editor made all those errors, leaving DK looking, at best, semi-illiterate. I’m still awaiting blooms on the one I bought labeled Hoya gigantangensis, with leaves that look almost exactly like those of Hoya incrassata. They are not at all shaped like those of Hoya bordenii, as DK’s description claims. It will be interesting to see just what I have, when it finally blooms. Maybe I was sent the wrong plant. Only the blooms (when compared to the holotype), will tell. Bob Smoley’s GARDENWORLD -- I found 42 errors in the listings of things I know about. There are some others that I believe are errors but I’m not familiar enough with those things to comment. 1). He lists a Hoya angustifolia. Fact: What he sells in not that species. Hoya angustifolia Traill was published in 1827. It turned out that it was a narrow leafed clone of Hoya pottsii Traill, native to the Asian mainland. Once used at the rank of species, even though vacated, the code does not allow the name to be used again by a different species. A. D. E. Elmer gave a Philippine species the name of Hoya angustifolia, which is what I believe Mr. Smoley has. Elmer’s use of that name wasn’t tenable due to the previous publication and to the fact that he published in English and the Code mandates that it be in Latin. I do not know what this species is but I believe his source was Ted Green or someone who got it from Ted Green. If I am correct, it could be one of at least 4 different species (one of them a dischidia) that Ted Green has, at one time or another, sold mislabeled Hoya angustifolia. The man is bound and determined to sell a plant with that name. When one of his offerings is proved wrong, next year his catalog will still listed the name but the buyer got a different species. I know. I have copies of his catalogs dating from 1977. I bought his “Hoya angustifolia” 4 years in a row and got 4 different species. I’d been warned that I would but “I’m from Missouri!” I have to see proof with my own eyes! The last one I bought as that species turned out to be Hoya kentiana. So, if you get a hoya with the label of Hoya angustifolia, you can be 100% certain that the hoya is mislabeled. 2). He listed a Hoya australis albomarginata. This is a cultivar. The Code for Cultivated Plants, says that we may not give cultivars Latin names. Cultivar names must be vernacular and each word in a cultivar name must be upper cased. This hoya with its white edged leaves needs a name that conforms to the Code. This name doesn’t conform. 4). He listed a Hoya carnosa Krimson Princess. This may be correct. I don’t know, as there were no leaves exposed, BUT—read on. 5). He listed a Hoya carnosa Rubra. This may be correct. I don’t know BUT if both of these are correct, BOTH are the SAME identical cultivar. One name is the correct cultivar name and the other a trademark name. Proof of this is found in the US Patent Docket and in scores of books and magazines from the 1950s, 1960s, and 1970s. I have copies of all of them. If these two are different, then one of them is mislabeled. Don’t be fooled into buying the same thing twice! Save your money to buy something you don’t already have. 6). He listed a Hoya caudata and described the flowers as “buff” coloured. I flat out guarantee that if your plant has “buff” coloured flowers, you don’t have Hoya caudata. Its flowers are the same colour as newly fallen snow, except for the coronas, which are reddish purple (or purplish red). 9). He misspelled Hoya deykeae (as Hoya deykei). 10). He misspelled Hoya golamcoiana (as golamciana). 11). He listed a Hoya gonoloboides. AGAIN FOR THE 1000TH TIME – AT LEAST. There is NO Hoya gonoloboides. If there were, it would be a thin leafed thing with very large, ovate leaves. All parts of the plant would be covered with reddish brown bristly hairs. I am confident that what this person is trying to sell you is one of the various clones of Hoya diversifolia, having long narrow dark green, glabrous leaves. See PS-TheHoyan vol. 2, #1 for a picture of the plant that was mistakenly published as Hoya gonoloboides. 12). He listed a Hoya gracilis. He doesn’t have Hoya gracilis unless it is the one DK recently published as ­­­Hoya panayanensis --- should it, as I suspect, turn out to be that species, AND if living material of it is circulating, which is doubtful. Hoya gracilis corollas are almost rotate (or slightly recurved, not reflexed) and they are hairy over their entire surfaces. The corolla tips are not glabrous as most Acanthostemma section hoyas are. 13). He described Hoya linearis leaves as round. They are linear!!! 14). His Hoya latifolia is a phony. Best guess is that it is either Hoya macrophylla, polystachya, Hoya clandestina or Hoya tjadasmalangensis. All of these are very similar and not at all like Hoya latifolia. 15). His Hoya loycesandrewsiana is Hoya latifolia..
16). I have expressed doubt as to the identity of this one but, in going through my files, I found that I have a picture of a syntype specimen of this (found at Arnold Arboretum. It appears to be correct. 17) & 18). These are, per David Liddle Hoya tjadasmalangensis. Or they could be Hoya clandestina. 19). His Hoya madulidii is Hoya ciliata. 20). He listed a Hoya membranifolia. AGAIN, this is not a hoya. It is a Dischidia. 21). His Hoya meredithii is Hoya vitellinoides. 22). Hoya neoebudica is misspelled (as Hoya neo-ebudica). The rule is that when a name is made up of a full word and a word element the name should not be hyphenated. “Neo-“ is a word element, not a stand alone word, therefore, no hyphen. 23). He listed a Hoya oblongata. There is no such hoya. I don’t have a clue as to what this one really is. 24). He listed a Hoya ohdongota. There is no such hoya species! Hmm—that name almost makes a sentence, “oh Don, go ta—Now let me see, “Where do I want Don “ta” go? Give me time and I’ll think of a very warm place! 25). He listed Hoya oreogena. None I’ve seen with this label is this species so I’m sure he doesn’t have it, unless it is parading with a different label. 26). He says that Hoya pachyclada has green and pink flowers. It has snow white flowers. Hoya finlaysonii X Hoya pachyclada has green tinged white flowers with dark pink-rose in center of the white corona. Perhaps that is what he has. 28). He listed a Hoya pimenteliana. The correct name is Hoya cagayanensis. 29). He listed a Hoya ployneura. That should be Hoya polyneura. 30) & 31). He listed Hoya pseudo-literalis. There are three things wrong with that. The first is that it is Hoya anulata and the second is that the name is made up of a word and a word element, therefore there should be no hyphen. The third thing wrong with it, is that C. Norman’s publication spelled the word after the hyphen littoralis (2 ts; no e; 1 o where this guy’s e is. 33). It’s Hoya purpureo-fusca not Hoya purpureofusca. This compound word is formed by two stand alone words, not a stand alone word and a word element, therefore, in this case, the hyphen should be there. Fusca is not, as some assume, a word element. It is an adjective. It means “dark,” as in dark purple, dark brown, dark hair, dark eyes, etc. 34). He lists Hoya ruscifolia, which is not in circulation, unless it is, as I suspect, that wee Philippine version of Hoya curtisii. I think he has DS-128, which is a variety of Hoya bilobata. 35). He listed a Hoya sieriae Laguna. I suspect that he meant Hoya siariae and that it is a native of Laguna. If so, he misspelled siariae. 36). He listed a Hoya sigatilis. There’s no such hoya. Perhaps he meant Hoya sigillatis. 37). He listed a species “Nong Nook.” It’s Nong Nooch, not Nong Nook. Nong Nooch is the place where a number of hoyas were found. It would have been better if he’d kept the IML# attached. 38). He listed Hoya subquintuplinervis as having large prominently veined leaves and “buff” coloured flowers. It has almost round leaves about 2.5 to 3 inches in diameter. They are rather fleshy with trinerved veins, which are not at all conspicuous. They have a suede-like texture. Flowers are white. 39). He misspelled Hoya thomsonii (as thompsonii). 40) & 41). He listed DS-70 as Hoya tsangii and he said the flowers are yellow. First off, DS-70 is not Hoya tsangii and second, its flowers are not yellow; they are rusty red. However, Hoya tsangii flowers are yellow. It is the one that DK gave the superfluous name of Hoya odetteae. 42). On reading this catalog again, I noticed that I missed one, up the line somewhere. It was listed as Hoya ciliata. Further down the page he listed Hoya madulidii. They are both the same species. Hoya ciliata was published first so it is the correct name. Note: Next issue, I have a request to review and comment on the SRQ catalog. I’ll do my best but the pictures in that on line catalog are about the lousiest I’ve seen anywhere. It will be difficult to tell what’s what there. If there is a particular Hoya dealer’s catalog that you’d like me to publish my very biased opinion on, let me know and I’ll try.